Ecocem Ireland is an independent, specialist producer of GGBS (Ground Granulated Blastfurnace Slag) – better known to most of us as ‘cement’. Ecocem is a company with international reach, with production facilities located in The Netherlands, the south of France as well as in Dublin Port in Ireland. In fact, the purpose-built GGBS plant in Dublin is the first of its kind in Ireland and a statement of Ecocem’s commitment to meeting its customers demands at all times. There you have it. 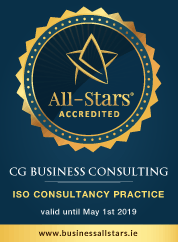 ISO certification with CGBC – a solid foundation for business success. If you would like your organisation to gain ISO Certification within 12 weeks, fill out the contact form to the right.